Eliot Ness versus America's first serial killer. It sounds like a great concept for a movie, but so far, the best version of the story can be found in a comic, courtesy of Brian Michael Bendis and Marc Andreyko. Elliot Ness is famed for the Untouchables, hunting Al Capone and fighting against bootleggers during the prohibition era. These stories have been the subject of many movies and books, each seeking to tell the real story of Elliot Ness. Yet very little is written about what happened after he left Chicago. Enter Brian Michael Bendis and Marc Andreyko. 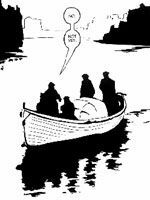 Taking the story of a case from after Ness's Untouchables days, they wove together a story involving grisly murders and Ness trying to come to terms with his fame. What makes the story remarkable is that it is based on actual events, something fairly unusual for comics. The story is based upon a series of unsolved murders that occurred around the time of Ness's appointment as Cleveland's Safety Director. The key point here is that they remain unsolved murders, so Bendis and Andreyko have had to fictionalise areas of the story, especially the conclusion. 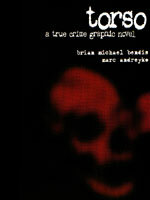 As with FROM HELL, the fictional parts of the story are created from exhaustive research, utilising a popular theory about who the killer actually was, and giving reasons as to why the killer's identity was covered up. Some of the research and reference materials are reprinted at the back of the book, allowing the reader to see first hand some of the autopsy pictures and news reports from the time. The comparison with FROM HELL is inevitable, as it too deals with a real life unsolved series of murders. However, where FROM HELL puts a fantastical slant on its story, TORSO opts for a more realistic approach, keeping the story grounded in reason, and focusing more on the detective work behind the investigation. It's a complex story, and the authors deal very well with the interpersonal relationships that lie at its heart. One gains a sense of what these people were actually like, and develop attachments to them as if they were real. And in this case, of course, they were, but not all historical fiction manages this effect so well. Bendis and Andreyko present their story in a very cinematic fashion, using silent panels to their full advantage and keeping much of the dialogue down to what is strictly necessary. Bendis's artwork is sparse and, at times, repetitive, creating for the reader an occasional sense of unease. It's perfectly suited to black and white presentation, a style that also adds to the sense of history in the book. Had it been presented in colour, something would definitely have been lost from the story. The use of photography in some of the panels adds to the tone of realism, without ever appearing out of place. Bendis's trademark cut-and-pasting of panels is also present, and effective. This isn't a story that needs strange transitions or large-scale action scenes. There are various news clippings interspersed throughout the story, each one relevant to the story pages. The clippings provide the reader with an idea of what the people of the time were thinking. It also enhances the story in much the same way as the photography does, adding elements of realism to the story. It's possible to tell that this book was created with a film adaptation in mind (as suggested by Bendis' hilarious Hollywood memoir, FORTUNE & GLORY), as TORSO has no overly complex scenes and a relatively small cast of characters, which should make it quite cheap to shoot. While this many give the reader some idea about why certain aspects of the story are presented in the manner they are, it doesn't distract from the overall quality of the book. The greatest triumph of this book is the way that it challenges the stereotypes of the medium. It tells a story that would not be out of place on the Biography or History Channels, keeping a subdued tone throughout. It's a story of a sort not traditionally told in the comic book medium, and therefore it's the type of book that could easily be sold outside of the industry. This is the story of the case that may have been responsible for ending Elliot Ness's career. 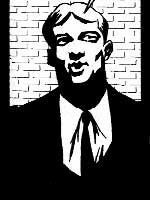 After failing to solve the case after so publicly announcing that he could, Ness lost face in the eyes of the people. Shortly thereafter, he lost his bid to become mayor of Cleveland. TORSO adds new elements to the story of an American legend, and paints a more human picture of him than most. TORSO is a dark edgy story that would appeal to any fan of crime fiction, but by rooting itself predominantly in historical fact, the story can also be enjoyed by a wider audience. TORSO screams out for release to a wider market, and if it takes a movie adaptation to make it achieve that, then that's something to stay hopeful for. In the meantime, this book is more than strong enough to stand on its own. Lawrence Rider is the author of REAL LIVES.